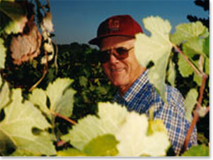 Biographical Sketch Richard G. Peterson, Ph.D.
Dr. Peterson began his career as a home winemaker in 1948 in Iowa. After receiving his B.S. degree in Chemical Technology from Iowa State University in 1952, M.S. in Food Technology (1956) from the University of California, Berkeley, and PhD in Agricultural Chemistry from the University of California, he joined the E. & J. Gallo Winery in New Product Development and Research in 1958. During his ten years at Gallo his major jobs included Research Director and Assistant Production Manager in charge of winemaking. From April 1968 until October 1973 he was Winemaster at Beaulieu Vineyard at Rutherford in Napa Valley. From November 1973 until 1986 he was Winemaster and President of The Monterey Vineyard, producing unique wines such as California's first Botrytis Sauvignon Blanc, Botrytis Pinot Noir, January Harvest Gamay Beaujolais and December Harvest Zinfandel. 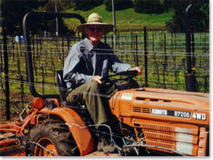 From April 1986 until April 1990, he was Winemaster and President of Atlas Peak Vineyards (Chairman from April 1989). At Atlas Peak, Dr. Peterson developed 450 acres of vineyard from virgin, volcanic soil, pioneering California's largest Sangiovese planting to date. He designed and supervised excavation of California's most extensive winery storage caves (40,000 sq. ft.), oversaw construction of a 960 acre-foot reservoir and produced the first three vintages of Atlas Peak wines. He led a group of investors in purchasing the Folie a Deux Winery in St Helena, Napa Valley, California in March 1995 and remained Chairman there until the winery was sold in 2004. He continues today as viticulture and enology consultant, and often as an expert witness in legal cases, for several high quality winery operations in California. 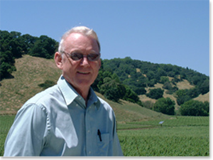 In 1977-1978, Dr. Peterson was President of the then 2000-member professional group of winemakers and grape growers (The American Society for Enology and Viticulture), having been a professional member since 1959 and a Director (1973-1975). He was a long time director of Wine Institute, past Chairman of WITS, a Supreme Knight in the Universal Order of Knights of the Vine and a member of most professional wine societies. He is a founding member of the American Institute of Wine and Food, AWARE, Society of Wine Educators, and the International Wine Academy. He is a former Napa Valley Wine Library V.P. and Instructor of Wine Appreciation. He taught "Appreciation of Wine in Moderation" courses for twelve years at Hartnell College in Salinas, California and has been a guest lecturer at U.C. Davis, Ca. He lectured on Viticulture and Enology at the International Wine Academy, the Hotel School at the University of Houston, Texas, and elsewhere. He has judged wines professionally in Australia, Portugal, France, Argentina and the U.K. as well as continuing to judge at most major American competitions. 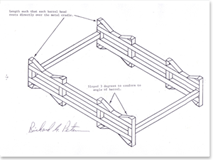 Dr. Peterson is the original designer of the steel barrel pallet which is now used by most of America's wineries and many around the world. He published the design, formally presenting it to the wine industry (WITS Proceedings, 1974) rather than patenting it. The drawing at left is from the Wine Industry Technical Seminar, Official Transcript, Fresno, Nov, 1975. The first winery ever to use Peterson Pallets was, you guessed it, The Monterey Vineyard, where Peterson was Winemaster and Luigi Fortino was Cellar Manager. He has authored numerous publications, including winery newsletters, research articles in technical journals, a column on common sense winemaking in Wines & Vines magazine and was an original wine host for America Online. He holds patents on improved wine production processes and methodology for treating plant diseases, notably Pierce's Disease of grape vines. His approach uses a novel method for forcing plants to accept the injection of antibiotics or other active agents, which could not otherwise be injected into grapevines or other plants. The antibiotic is packed dry into a slotted, hollow nylon screw. When the screw is fixed into the trunk of the plant, rising sap dissolves the antibiotic and takes it throughout the plant where it kills the invading disease bacteria. As a consultant in past years, he created many new wines, including Lancers Vinho Branco in Portugal, the J. Wile line of Varietal wines, Seagram's first wine cooler and all the original Taylor California Cellars varietal and generic table and sparkling wines. Both his daughters are graduate Enologists, with degrees from U.C. 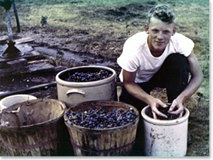 Davis, working in the wine industry. Dr. Peterson is currently Vice President of the Monterey Wine Auction, which develops funds to support outstanding, and often needy, students in the wine, food and hospitality industries. He has been Chairman of the Andre Tchelistcheff Scholarship Committee since its origin at Monterey in 1986. This committee has awarded over $1,000,000 in scholarship funds to college students over the past twenty-plus years – all generated from the Monterey Wine Auction events and personal donations.